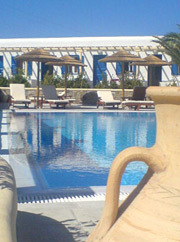 Petinaros Hotel is a small hotel of 29 rooms and studios, located in the area of Petinaros. The location is ideal for those who wish to experience the charming country side of Mykonos without being far away from town. Petinaros Hotel is located in Petinaros area - 1,5km from the airport, 800m from the port, 700m from the town centre and 700m from the nearest beach. THE ABOVE DAILY RATES ARE IN EUROS (�) PER ROOM AND INCLUDE BREAKFAST AND ALL TAXES. THE ABOVE DAILY RATES ARE IN EUROS (€) PER STUDIO AND INCLUDE ACCOMMODATION AND TAXES.